We’ve seen some strange things on MSNBC’s newly inaugurated “hard news block.” Yesterday the desperate cable channel took another step away from its announced move toward dayside journalism as one of their opinion hosts masqueraded as a news anchor. “Lean Forward” no longer appears on the screen, but it’s still there in spirit. The 3:00 pm hour was hosted (“anchored” is too respectable a term) by Ari Melber, previous holder of a liberal chair on The Cycle and fill-in host for the likes of Lawrence O’Donnell and Rachel Maddow. But yesterday, with a wave of Andy Lack’s hand, opinionizer Ari Melber was transformed into a hard news anchor. What sort of problems does this raise for MSNBC? In The Cable Game you don’t want to lose the trust of your viewers; when they tune in for hard news they expect to get it. Yesterday Melber spent an entire block on the Iran deal, most of that in an interview with a former Republican Senator. Yes you read that right, a Republican on MSNBC. But don’t call Robert Ripley just yet—it was Richard Lugar, who just happens to support the Iran deal. And so does Ari Melber. ARI MELBER: Right. I mean, that’s the argument that when you put aside the rhetoric and the bluster, not completing this deal would actually in a way be soft on Iran. MELBER: When Senator Schumer and some of your former Republican colleagues say otherwise, are they sort of discounting the fact that this takes a lot of different countries to get it done? MELBER: And so when you look across some of the Republican opposition, do you think a lot of it is simply that there is intense partisan opposition to this President and that a Republican President who struck the same deal…would have more support from the GOP to do essentially the same thing? Objection, Mr. Melber. If you try any harder to lead the witness you’ll need a baton. This is what happens when opinionizers play at journalism. When their buddies are at the plate every pitch is a softball. One more thing. Ari Melber is not just a lefty opinionizer; he’s an activist who not only supported Democrats running for office but worked on their campaigns. 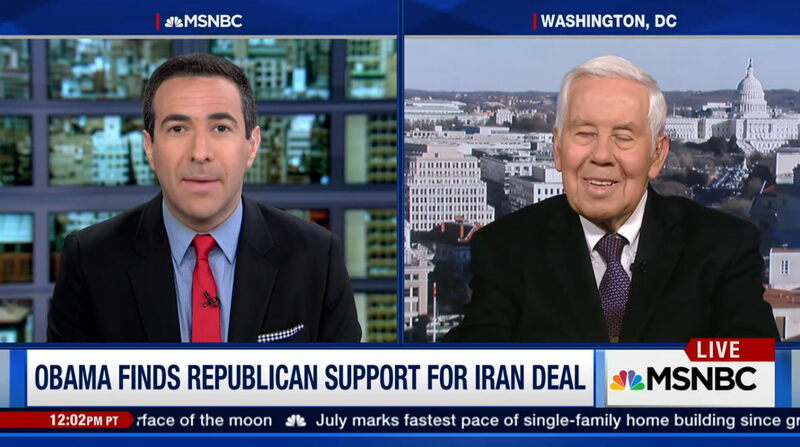 One of them was John Kerry—who just happens to have brokered the Iran deal that Melber and Lugar were promoting. In fact Melber was on the national staff of Kerry’s Senate campaign. Why weren’t viewers told? Isn’t it relevant to MSNBC viewers expecting “hard news” in the 3:00 pm hour? Do we no longer care about conflicts of interest? Why was there no disclosure? And how is this any different than Martha MacCallum, Bill Hemmer, Bret Baier, Heather Childers, Ainsley Earhardt, Jon Scott or Jenna Lee, Anna Kooiman, Shannon Bream and Harris Faulkner posing as “news anchors” and asking leading questions in Fox’s “fair and balanced” debates? Have you criticized their anchoring duties as vociferously as you are doing with Melber here? If you want to go after MSNBC for these infractions, you might want to hold a network that touts its supposedly balanced debates to the same standard. Oh, that’s right. I forgot you have an agenda to attack MSNBC with your anti-liberal tilt. My mistake. P.S. A lot of those same Fox anchors that call themselves “straight-news” have appeared on the show “Outnumbered,” and clearly state their opinions as much as a Kimberly Guilfoyle or Andrea Tantaros do there, then they go back to their regular “news” shows to report on current events, as if they are perfectly objective. Ari Melber debated a conservative? While anchoring a “hard news” hour? When was that? I’ll criticize anyone’s anchoring whose only journalistic bona fides consists of a career hacking for politicians. Journalism training and/or experience are the bare minimum and Melber has neither.